Local Elections May 2, 2019. Meet Our District and Town Council Candidates. 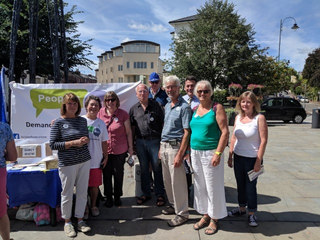 Wealden LibDems joined with Tunbridge Wells LibDems to campaign for a People's Vote on the final Brexit deal in Tunbridge Wells centre on Saturday. There was great support for the pro-EU stall with a good group of volunteers talking to passers-by and plenty of lively debate about a possible Brexit deal, or no deal, or the option to stay in! People were reminded that it's not too late to cancel Brexit altogether and get out of the current impasse and give political space to address other pressing issues on the NHS, housing and local government cuts. We encourage everyone who wants to take action to sign the People's Vote petition here and to consider joining us in London on 20 October for the biggest anti-Brexit march yet on Westminster to pressure our MPs to do the right thing for our country and get an Exit from Brexit !